Scrolling through the Independent Foreign Fiction Prize (IFFP) longlist at the beginning of March, one of the books I was particularly looking forward to reading was Back to Back. Julia Franck is a new author to me, but her critically-acclaimed earlier novel The Blind Side of the Heart won the German Book Prize and I was intrigued by the prospect of Franck’s latest one. This powerful opening gives the reader a taste of the children’s life with Käthe, a Jewish sculptor and avid supporter of the socialist ideology. Käthe, a self-centred and callous woman who cultivates relations with the State to further her career, is a formidable presence in the book. But it is Ella and Thomas who form the heart of the narrative; Back to Back carves the story of their adolescence. Thomas, the more sensitive of the two siblings, also suffers at the hands of his mother as she forces him to pose for her sculptures naked and shivering in the cold. The teenage Thomas finds a release through poetry; he’s talented and dreams of becoming a writer, a journalist, but Käthe has other plans for his future. Dismayed at his lack of interest in the Party and the birth of a new society, she arranges for Thomas to undertake a ‘manual apprenticeship.’ On finishing school, the young and fragile Thomas is dispatched to a stone quarry to work for the ‘class struggle’. The role turn out to be little more than slave labour; he experiences further abuse — both physical and emotional – and comes perilously close to being destroyed altogether. In the final third of the novel, Thomas finds love in a tender and compassionate relationship with Marie, a ward sister at the local hospital. To reveal any more of the narrative at this stage would be unfair, save to say that this closing section is deeply affecting and worthy of the reader’s investment in this book. Back to Back is an acutely penetrating and haunting book. Not an easy read, but one that will gnaw away at me for weeks to come. In one sense, this novel paints a picture of a heartless and indifferent mother. It gives us a window into the fractured lives of adolescents raised in such an environment, abandoned by their mother and subjected to systematic abuse at almost every turn. In another sense, it can be read on a more allegorical level with Käthe representing the harsh realities of the political system in place in the German Democratic Republic in the late 1950s and early 1960. It’s a regime that smothers the hopes and dreams of those who look to their guardian for support and encouragement in life; Thomas especially feels penned in by the Berlin Wall, trapped by its oppressive presence. The metaphor isn’t quite as straightforward as I’ve described there — Käthe is a complex character and past events have left their mark on her character — but it’s a plausible one nonetheless. Franck’s prose, especially in the early sections of the narrative, is very much in tune with the tone of these themes. She writes in a style that is quite concentrated, a little close-knit in places and it took me a while to adjust to its pattern and rhythm. However, Franck is a very accomplished writer indeed and Anthea Bell’s translation is excellent. There are segments where the prose opens up and shines, particularly in the final third of the book….and once I fell into step with the cadence of its language, I found myself totally engrossed in Back to Back’s narrative, emotionally invested in Ella and Thomas’s characters. Their story becomes all the more poignant when we learn that Thomas’s poems, which appear throughout the novel, were written by Franck’s uncle (Gottlieb Friedrich Franck) as a young man; Julia Franck appears to be drawing on the roots of her own family history here. 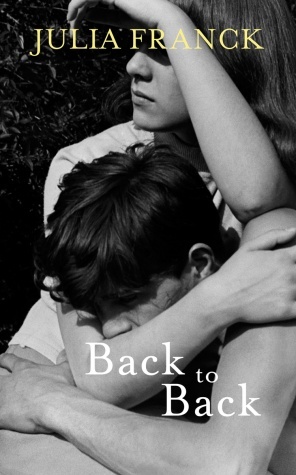 Back to Back is a very good novel, one of the most affecting I’ve read so far this year. I read this book as part of an IFFP-shadowing project led by Stu at Winstondad’s blog. Other members of the IFFP shadow group have also reviewed Back to Back: Tony Malone, Bellezza and Tony Messenger – just click on the links to read their thoughts. This review was first published as a guest post on Naomi’s The Writes of Women blog (2nd April 2014) and Naomi has kindly granted her permission for me to republish my review here. Back to Back is published in the UK by Harvill Secker. Source: library copy. This entry was posted in Book Reviews, Franck Julia, Women in Translation and tagged #GermanLitMonth, #ReadWomen, #ReadWomen2014, #TranslationThurs, Book Review, Fiction, Germany, Harvill Secker, IFFP, Julia Franck, Literature in Translation, Women in Translation on May 27, 2014 by JacquiWine.